If you like your casual walking suits and like them with real head turning style, take a look at what Robert Lewis has come out with this season. Robert Lewis has expanded a bit since coming out with their bold style dress shirts and now put their design skill into a collection of casual walking suits that are sure to please. 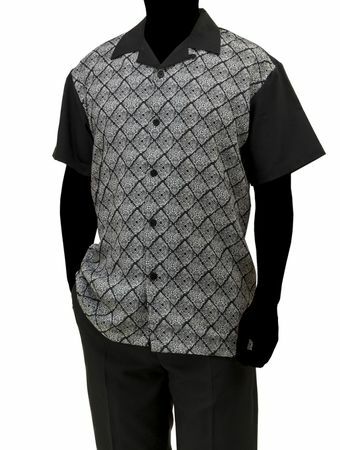 This black and grey pattern front walking suit features a regular fit with open collar style top with flap pocket pants to match. Made of poly/rayon.